A low risk confined space exists where there is easy entry/exit and natural ventilation. Low risk shallow entry with adequate natural or mechanical ventilation, where access is simple and unobstructed and there is no likely risk of flooding. 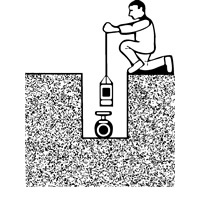 Eg: meter pits, valve chambers, booster-pumping stations, PRV chambers. A medium risk confined space exists where there are access issues; a realistic expectation of encountering a specific risk; possible introduction of specified risks during the work activity. Vertical direct unobstructed access with continuous attachment to a man riding hoist or similar mechanical rescue device. 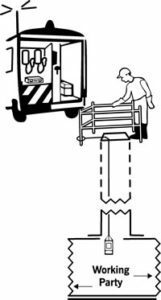 When it is not possible to have persons permanently attached to a safety line. Usually it will be a team entry which moves away from the entry point. Eg: Man entry sewers, utility service subway tunnels, aqueducts and complex wet walls. Working without an attached rescue line and includes working away from the point of entry. 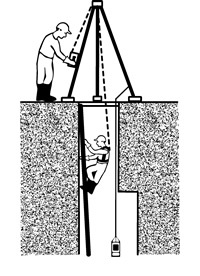 A high risk confined space exists when there is a specified hazard that cannot be controlled or eliminated. Non standard entries involving complex operations which introduce additional risks and require specific controls and rescue arrangements. Eg: mechanical hazards, physical complexity of system introduced hazards, enhanced specific intrinsic hazards. Full breathing apparatus (working) required to be worn at all times in high risk. High risk entries require the presence of personnel who have designated responsibilities for dealing with emergencies.